This is our baby, a 1982 Newell 36' Motorcoach diesel pusher. We never, ever thought we would own a motorhome of this quality, or size. 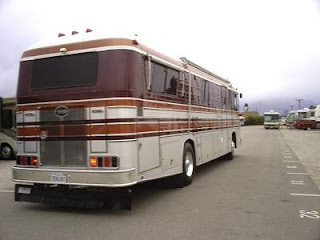 Our prior RV experience was a 1987 Fleetwood Tioga 26' Class C motorhome with a 460ci gas guzzler Ford big block V-8. Driving that motorhome now feels like driving an American Motors Matador compared to the Newell. The Newell Corporation headquarters is Miami, OK....way up in the northeast corner of the state.....just a few miles from the Missouri border. They were founded in 1967, and have manufactured an average of 35 coaches a year since then. They were the first, and only manufacturer to build their own chassis from the ground up. They were the first to employ the diesel pusher technology in motorhomes, and the first to specialize in mid coach entry doors. They continue to be leaders in the industry, and are considered in the same breath with Prevost. The Newell provides us with most all the amenities of home....kitchen with oven/stove, microwave, double sink, refrigerator-freezer (over/under), plus a basement refer. We also have a Splendide washer/dryer combo, bathroom with toilet and sink on the passenger side, and a full shower on the driver side, both with closing doors. Our master bedroom is in the rear of the coach featuring an overside queen size pedistal bed, and 4 hanging closets, and a vanity for Elaine. In the salon area we have a queen size sofa bed, and a small dinette area. Included are two LCD TV's...one in the salon, and one in the bedroom. We had oak wood floors installed shortly after we bought the coach. The exterior is covered in rivited aluminum, and painted with DuPont Imron paint, still the original paint applied originally in 1982. It is powered with a 6V92 TA Detroil Diesel 2 stroke 350 turbo charged horse power engine. The genset is a Kohler 7.5kw LPG.